Is it any wonder why a disconnect exists between the public and the scientific positions in regards to climate change? The horizontal axis above refers to an unconstrained emissions (“business as usual”) scenario. The vertical axis is roughly proportional to the probability of finding that an expert’s opinion is matched at that point on the axis. I very much appreciate that you have taken notice of this idea, and I hate to be this way, but I’d appreciate if you’d explicitly note that this graph was drawn by me. I have a bit of a history of not getting credit for my ideas. At this point it would help me if that stopped. I appreciate the h/t but that seems a bit shy of full credit. I have altered the page to express copyright. I will release the graph into the creative commons. You may reproduce conditional on giving me credit. I apologize, got not giving you proper credit. I have removed the h/t, and explicitly stated that you created the graph. If this isn’t satisfactory then please let me know so I can correct the situation. 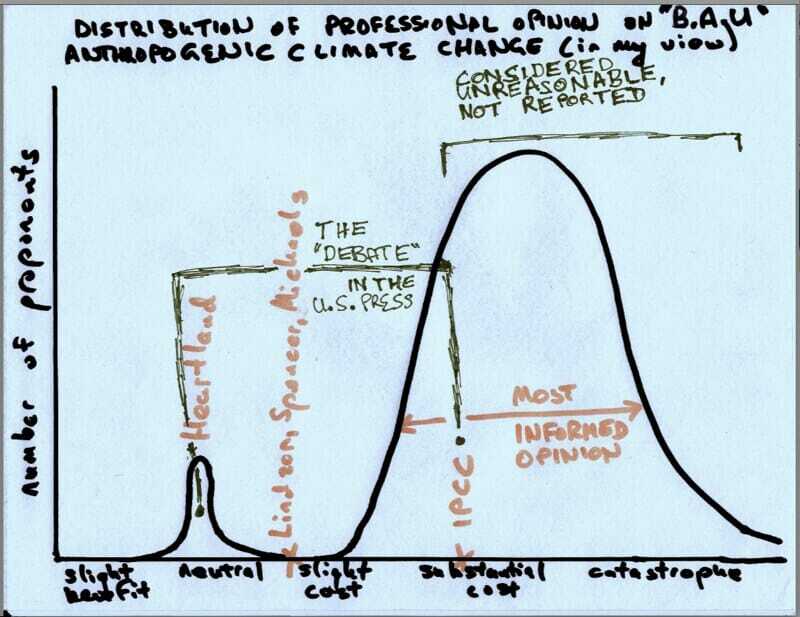 Notice that the graph mentions debate in the US media. Your links are from the Guardian the BBC, and Nature (which isn’t part of the MSM). None of your links can be classified as part of the US MSM. Though I bet if you look hard enough you can find the occasional exception to the rule. Thanks for the edit. Much appreciated.